Amon Amarth frontman Johan Hegg says his band’s tag as a viking metal group makes no sense. The singer says he is fed up with the term and adds that it is only applied to them because of their lyrical content. By that logic, he says, Iron Maiden and Black Sabbath are viking metal bands too. 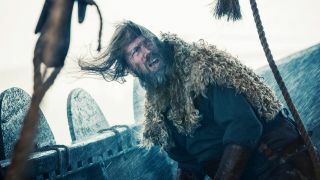 Hegg recently wrapped up filming on new movie Northmen – A Viking Saga, in which he plays a viking warrior called Valli. And Amon Amarth sing about viking culture and even feature images of the warriors on their artwork – but still Hegg would rather not be branded a viking metal band. He tells Metalinside: “It’s weird to label a band after the lyrical content because, in that case, Iron Maiden is a viking metal band, Black Sabbath is a viking metal band, Led Zeppelin is a viking metal band. Hegg also discusses his acting work on the film, which was shot mainly in South Africa. He says he enjoyed the experience, although he can’t say whether or not he is a good actor. “So when you look at that guy over there and you hate his guts, you really have to hate his guts. You have to say that in your head, because all of a sudden, it just comes out that way. It’s a strange experience, but a lot of fun. “I don’t know how good of an actor I am. The director was really, really happy. One of the producers, and I will take his word for it, Frank Kaminski – he’s a great guy. Amon Amarth released their ninth album Deceiver Of The Gods in June.